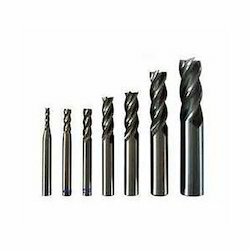 With wide expertise in this domain we have come up with superior quality End Mills. 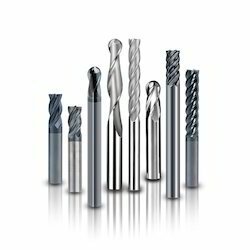 Our range includes HSS End Mills and Solid Carbide End Mills. Our vendors manufacture these products with adherence to both national and international standards. Moreover, after procurement of the products from our vendors we test these on various parameters to ensure their flawlessness. We strive to provide our clients with best-in-class products that are highly durable, high in performance, resistant to corrosion and easy to maintain. We are majorly looking for queries from Middle East & Africa. Owing to our rich experience in this domain, we are engaged in offering a quality tested range of Coated Solid Carbide End Mills. These mills are offered 2 Flute, 3 Flute & 4 Flute Ultra microfine grade of carbide (Un Coated/ TiN/ TiCN/ TiALN Coated) to meet the diverse requirements of our clients. Moreover, these mills are offered from dia.1 mm to dia. 20 mm. We are majorly looking for queries from Middle East & Africa. We are proud to present our clients a extensive range of Solid Carbide End Mills. Clients can avail these from us in 4 flute, 2 flute and 3 flute. Uncoated/ TiN/ TiCN/ TiALN Coated are that carbide grade that we offer with 1 mm to 20 mm diameter for our products. We test these products on various parameters before offering these to our clients. Our products are available to our clients in ball nose long reach, corner radius, square end regular length, square end long length, ball nose short length and square end short length types. We are majorly looking for queries from Middle East & Africa. 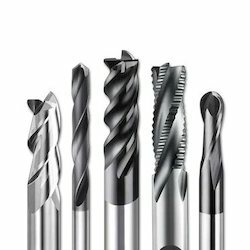 For meeting the diverse requirements of our clients, we are engaged in offering a wide range of HSS End Mills (High Speed Steel End Mills). These mills are manufactured in compliance with the set industry standards and norms using high-grade raw material and advanced technology. The offered mills are available in center cutting and non center cutting types with different options like 2, 3, 4, 6 and 8 flutes. We are majorly looking for queries from Middle East & Africa. 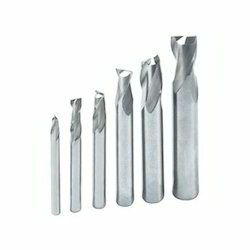 We have gained expertise in offering a superior quality range of Parallel Shank Roughing End Mills. These mills are manufactured in M2 and M42 grades of H.S.S. as per the international standards and norms. Clients can avail these mills in 2,3,4,6 and 8 flutes center cutting and non center cutting type. Moreover, the offered mills are tested on various parameters so as to ensure their durability and accurate dimensions. We are majorly looking for queries from Middle East & Africa. Looking for End Mills ?